A list of websites which I like or consider exceptional. Robert Westall - the official website of author Robert Westall. Montague Rhodes James - a website dedicated to all things M.R. James. Hudson Horror Show - The Horror, Sci-Fi and Exploitation Film Festival so shocking, so disturbing, they didn't want you to see it! Pan Book of Horror Stories - a nostalgic site celebrating the series of books which introduced so many people to horror fiction. Horror T-shirts at CafePress - just about anything you could ever want on a t-shirt. 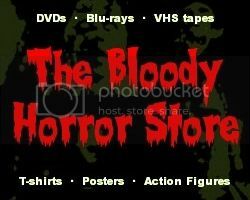 Horror Movie Posters - from AllPosters. Lots to choose from. Shark City Ozark - Your One Stop Creature EFX Shop. The Deuce - grindhouse cinema database.